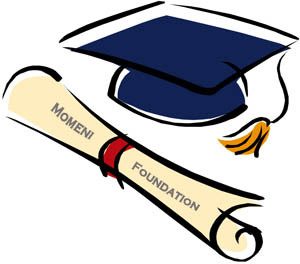 Momeni Foundation is now accepting scholarship applications for Year 2019. This year over $15,000.00 dollars will be awarded to students of Iranian descent. Momeni Foundation is dedicated to providing scholarships to graduating high school students and full time college students of Iranian descent anywhere in the world. Maa bekaareem o digaraan bokhorand"
Scholastic Achievement Scholarship: At least three (3 ea.) scholarships for an amount of $1,000.00 dollars each will be awarded to students that are graduating from high school and plan to attend college in Fall of 2019. Applicants must be US citizens or permanent residents of United States. Financial Assistance Scholarship: At least ten (10 ea.) scholarships for an amount of $1,000.00 US dollars will be awarded. The Financial Assistance Scholarship is available to all college students of Iranian descent regardless of citizenship or country of residency. Students must attend college as a full time student in Fall of 2019. Deadline for receiving the application material is June 30th, 2019. One scholarship for an amount of $1,000.00 dollars will be awarded to a student applying from the State of Florida and preferably from Tampa Bay Area. Application deadline for this SPECIAL scholarship is May 15, 2019. The award will be presented at the Graduation Ceremony of Persian American Society of Tampa Bay.